doe deer is a Fredericksburg based band consisting of four members, three of which attend the University of Mary Washington. Photo by Alex Birch. Doe deer, Plastic Nancy and Toward Space played a house show in a small, crowded Oregon Hill apartment called Plastic Palace Nov. 9. Doe deer is a four-piece band based out of Fredericksburg, Virginia, composed of Nabeel Mirza on vocals and guitar, guitarist Matt Leibowitz, Paul King on bass and drummer Forrest Fallon. They describe their sound as somewhere between jangly surf pop and lo-fi. Most of the inspiration for their music comes from underground indie bands and much of their sound can be attributed to the lead singer’s vocal style. “Some Teen Suicide, maybe some Quarterbacks. We just try to match Nabeel’s energy,” King said. With the exception of Fallon, the band is still in college, with Leibowitz, King and Mirza finishing up their senior year at University of Mary Washington, where they all originally met. While they were friends for some time, doe deer’s current lineup only recently came to fruition. Their first live performance was at the Songbyrd Music House in Washington, D.C. at the end of August. Doe deer has never played a show in Fredericksburg — and does not expect to in the future. 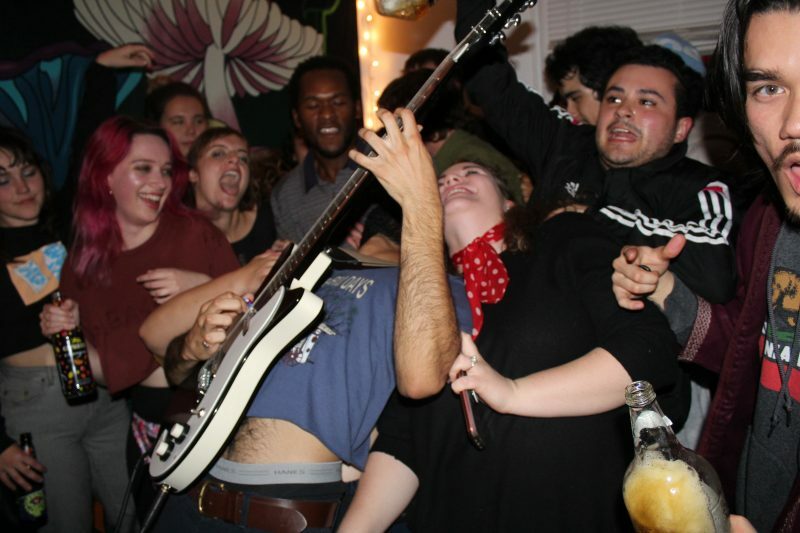 They have performed in Richmond a few times, but the majority of their performances take place in D.C.
Doe deer wants to go on a tour up and down the U.S. with Plastic Nancy, another band that performed at the Plastic Palace and also the owners of the house. They also cite major influences from iconic ‘60s musicians, such as the Beatles, Neil Young and the Grateful Dead, which led to their peculiar name. Plastic Nancy’s performance lived up to their influences with a wall of skull-crushing sound, and even played some new material for the first time. Doe deer followed with a stellar performance combining tight playing with rock ‘n’ roll showmanship. 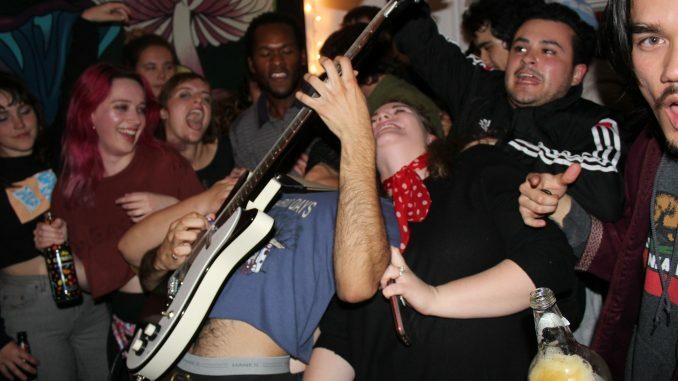 A highlight of their set was Mirza leaning backward into the frenzied crowd, relying on their support as he blazed through a crunching riff on guitar. The last act, Toward Space, was by all accounts just as lightning-packed. Doe deer is in the process of re-recording old material and hope to release an album with new songs by New Years. Plastic Nancy also plan on releasing an album soon, but no hard date has been announced. Toward Space released an album in September, which is available on all music streaming services.